The apparent aim of the assassination attempt was to wrest political control of Germany and its armed forces from the Nazi Party (including the SS) and to make peace with the Western Allies as soon as possible. The details of the conspirators' peace initiatives remain unknown, but they would have included unrealistic demands for the confirmation of Germany's extensive annexations of European territory. The plot was the culmination of efforts by several groups in the German resistance to overthrow the Nazi German government. The failure of the assassination attempt and the intended military coup d'état that was to follow led the Gestapo to arrest more than 7,000 people, of whom they executed 4,980. Since 1938, there had been groups plotting an overthrow of some kind within the German Army and in the German Military Intelligence Organization. Early leaders of these plots included Major General Hans Oster, Colonel General Ludwig Beck and Field Marshal Erwin von Witzleben. Oster was the deputy head of the Military Intelligence Office. Beck was a former Chief of Staff of the German Army High Command (OKH). Von Witzleben was the former commander of the German 1st Army and the former Commander-in-Chief of the German Army Command in the West. They soon established contacts with several prominent civilians, including Carl Goerdeler, the former mayor of Leipzig, and Helmuth James von Moltke, the great-grandnephew of Moltke the Elder, hero of the Franco-Prussian War. Groups of military plotters exchanged ideas with civilian, political, and intellectual resistance groups in the Kreisauer Kreis (which met at the von Moltke estate in Kreisau) and in other secret circles. Moltke was against killing Hitler; instead, he wanted him placed on trial. Moltke said, "we are all amateurs and would only bungle it". Moltke also believed killing Hitler would be hypocritical. Hitler and National Socialism had turned "wrong-doing" into a system, something which the resistance should avoid. Plans to stage an overthrow and prevent Hitler from launching a new world war were developed in 1938 and 1939, but were aborted because of the indecision of Army General Franz Halder and Field Marshal Walther von Brauchitsch, and the failure of the Western powers to oppose Hitler's aggression until 1939. In 1942, a new conspiratorial group formed, led by Colonel Henning von Tresckow, a member of Field Marshal Fedor von Bock's staff, who commanded Army Group Centre in Operation Barbarossa. Tresckow systematically recruited oppositionists to the Group's staff, making it the nerve centre of the army resistance. Little could be done against Hitler as he was heavily guarded, and none of the plotters could get near enough to him. During 1942, Oster and Tresckow nevertheless succeeded in rebuilding an effective resistance network. Their most important recruit was General Friedrich Olbricht, head of the General Army Office headquarters at the Bendlerblock in central Berlin, who controlled an independent system of communications to reserve units throughout Germany. Linking this asset to Tresckow's resistance group in Army Group Centre created a viable coup apparatus. In late 1942, Tresckow and Olbricht formulated a plan to assassinate Hitler and stage an overthrow during Hitler's visit to the headquarters of Army Group Centre at Smolensk in March 1943, by placing a bomb on his plane (Operation Spark). The bomb failed to detonate, and a second attempt a week later with Hitler at an exhibition of captured Soviet weaponry in Berlin also failed. These failures demoralised the conspirators. 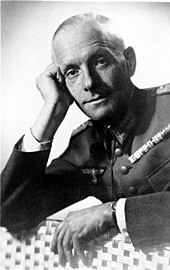 During 1943 Tresckow tried without success to recruit senior army field commanders such as Field Marshal Erich von Manstein and Field Marshal Gerd von Rundstedt, to support a seizure of power. Tresckow in particular worked on his Commander-in-Chief of Army Group Centre, Field Marshal Günther von Kluge, to persuade him to move against Hitler and at times succeeded in gaining his consent, only to find him indecisive at the last minute. However, despite their refusals, none of the Field Marshals reported their treasonous activities to the Gestapo or Hitler. While the main goal of the plotters was to remove Hitler from power, they did so for various reasons. The majority of the group behind the 20 July plot were conservative nationalists and did not necessarily believe in democratic ideas. Martin Borschat writes that the plot was mainly done by conservative elites who were initially integrated by the Nazi government but during the war lost their influence and were concerned about regaining it. This argument, however, would seem inadequate to explain the apparently higher ideals of Tresckow, who stated shortly before the attempt: "The assassination must be attempted, coûte que coûte [whatever the cost]. [Then,] even if it fails, we must take action in Berlin. . . . [W]hat matters now is that the German resistance movement must take the plunge before the eyes of the world and of history. Compared to that, nothing else matters." The overall goals towards Poland were mixed within the plotters. Most of the plotters found it desirable to restore the old German borders from 1914, while others pointed out that the demands were unrealistic and amendments had to be made. Some like Friedrich-Werner Graf von der Schulenburg even wanted all of Poland annexed to Germany. Many members of the plot had helped the Nazis gain power and shared revisionist foreign policy goals pursued by Hitler, and even at the time of the plot were anti-democratic, hoping to replace Hitler with a conservative-authoritarian government, which would be ruled by elites. They opposed popular legitimation or mass participation in governance of the state. By mid-1943, the tide of war was turning decisively against Germany. The army plotters and their civilian allies became convinced that Hitler should be assassinated, so that a government acceptable to the western Allies could be formed, and a separate peace negotiated in time to prevent a Soviet invasion of Germany. In August 1943, Tresckow met, for the first time, a young staff officer named Lieutenant Colonel Claus von Stauffenberg. Severely wounded in North Africa, Claus von Stauffenberg was a political conservative, a zealous German nationalist, and a Roman Catholic. From early 1942, he had come to share two basic convictions with many military officers: that Germany was being led to disaster, and that Hitler's removal from power was necessary. After the Battle of Stalingrad in December 1942, despite his religious scruples, he concluded that the Führer's assassination was a lesser moral evil than Hitler's remaining in power. Stauffenberg brought a new tone of decisiveness to the ranks of the resistance movement. When Tresckow was assigned to the Eastern Front, Stauffenberg took charge of planning and executing the assassination attempt. Olbricht now put forward a new strategy for staging a coup against Hitler. The Replacement Army (Ersatzheer) had an operational plan called Operation Valkyrie, which was to be used in the event that the disruption caused by the Allied bombing of German cities caused a breakdown in law and order, or an uprising by the millions of forced labourers from occupied countries now being used in German factories. Olbricht suggested that this plan could be used to mobilise the Reserve Army for the purpose of the coup. In August and September 1943, Tresckow drafted the "revised" Valkyrie plan and new supplementary orders. A secret declaration began with these words: "The Führer Adolf Hitler is dead! A treacherous group of party leaders has attempted to exploit the situation by attacking our embattled soldiers from the rear in order to seize power for themselves." Detailed instructions were written for occupation of government ministries in Berlin, Heinrich Himmler's headquarters in East Prussia, radio stations and telephone offices, and other Nazi apparatus through military districts, and concentration camps. Previously, it was believed that Stauffenberg was mainly responsible for the Valkyrie plan, but documents recovered by the Soviet Union after the war and released in 2007 suggest that the plan was developed by Tresckow by autumn of 1943. All written information was handled by Tresckow's wife, Erika, and by Margarethe von Oven, his secretary. Both women wore gloves to avoid leaving fingerprints. On at least two other occasions Tresckow had tried to assassinate the Führer. The first plan was to shoot him during dinner at the army base camp, but this plan was aborted because it was widely believed that Hitler wore a bullet-proof vest. The conspirators also considered poisoning him, but this was not possible because his food was specially prepared and tasted. They concluded that a time bomb was the only option. Operation Valkyrie could only be put into effect by General Friedrich Fromm, commander of the Reserve Army, so he must either be won over to the conspiracy or in some way neutralised if the plan was to succeed. Fromm, like many senior officers, knew in general about the military conspiracies against Hitler but neither supported them nor reported them to the Gestapo. As the war situation deteriorated, Hitler no longer appeared in public and rarely visited Berlin. He spent most of his time at his headquarters at the Wolfsschanze near Rastenburg in East Prussia, with occasional breaks at his Bavarian mountain retreat Obersalzberg near Berchtesgaden. In both places he was heavily guarded and rarely saw people he did not know or trust. Himmler and the Gestapo were increasingly suspicious of plots against Hitler and rightly suspected the officers of the General Staff, which was indeed the source of many conspiracies against Hitler. By the summer of 1944, the Gestapo was closing in on the conspirators. When Stauffenberg sent Tresckow a message through Lieutenant Heinrich Graf von Lehndorff-Steinort asking whether there was any reason for trying to assassinate Hitler given that no political purpose would be served, Tresckow's response was: "The assassination must be attempted, coûte que coûte [whatever the cost]. Even if it fails, we must take action in Berlin. For the practical purpose no longer matters; what matters now is that the German resistance movement must take the plunge before the eyes of the world and of history. Compared to that, nothing else matters." Himmler had at least one conversation with a known oppositionist when, in August 1943, the Prussian Finance Minister Johannes Popitz, who was involved in Goerdeler's network, came to see him and offered him the support of the opposition if he would make a move to displace Hitler and secure a negotiated end to the war. Nothing came of this meeting, but Popitz was not immediately arrested (although he was later executed towards the end of the war), and Himmler apparently did nothing to track down the resistance network which he knew was operating within the state bureaucracy. It is possible that Himmler, who by late 1943 knew that the war was unwinnable, allowed the plot to go ahead in the knowledge that if it succeeded he would be Hitler's successor, and could then bring about a peace settlement. Popitz was not alone in seeing in Himmler a potential ally. General von Bock advised Tresckow to seek his support, but there is no evidence that he did so. Goerdeler was apparently also in indirect contact with Himmler via a mutual acquaintance, Carl Langbehn. Wilhelm Canaris biographer Heinz Höhne suggests that Canaris and Himmler were working together to bring about a change of regime, but this remains speculation. Tresckow and the inner circle of plotters had no intention of removing Hitler just to see him replaced by the dreaded and ruthless SS chief, and the plan was to kill them both if possible – to the extent that Stauffenberg's first attempt on 11 July was aborted because Himmler was not present. On Saturday, 1 July 1944 Stauffenberg was appointed chief of staff to General Fromm at the Reserve Army headquarters on Bendlerstraße in central Berlin. This position enabled Stauffenberg to attend Hitler's military conferences, either at the Wolfsschanze in East Prussia or at Berchtesgaden, and would thus give him an opportunity, perhaps the last that would present itself, to kill Hitler with a bomb or a pistol. Meanwhile, new key allies had been gained. These included General Carl-Heinrich von Stülpnagel, the German military commander in France, who would take control in Paris when Hitler was killed and, it was hoped, negotiate an immediate armistice with the invading Allied armies. The plot was now fully prepared. On 7 July 1944 General Helmuth Stieff was to kill Hitler at a display of new uniforms at Klessheim castle near Salzburg. However, Stieff felt unable to kill Hitler. Stauffenberg now decided to do both: to assassinate Hitler, wherever he was, and to manage the plot in Berlin. 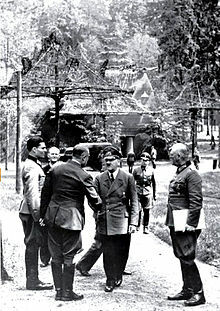 On 14 July Stauffenberg attended Hitler's conferences carrying a bomb in his briefcase, but because the conspirators had decided that Heinrich Himmler and Hermann Göring should be killed simultaneously if the planned mobilisation of Operation Valkyrie was to have a chance to succeed, he held back at the last minute because Himmler was not present. In fact, it was unusual for Himmler to attend military conferences. By 15 July, when Stauffenberg again flew to the Wolfsschanze, this condition had been dropped. The plan was for Stauffenberg to plant the briefcase with the bomb in Hitler's conference room with a timer running, excuse himself from the meeting, wait for the explosion, then fly back to Berlin and join the other plotters at the Bendlerblock. Operation Valkyrie would be mobilised, the Reserve Army would take control of Germany and the other Nazi leaders would be arrested. Beck would be appointed provisional head of state, Goerdeler would be chancellor, and Witzleben would be commander-in-chief of the armed forces. Again on 15 July the attempt was called off at the last minute. Himmler and Göring were present, but Hitler was called out of the room at the last moment. 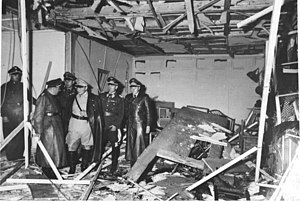 Stauffenberg was able to intercept the bomb and prevent its discovery. On 18 July rumours reached Stauffenberg that the Gestapo had knowledge of the conspiracy and that he might be arrested at any time—this was apparently not true, but there was a sense that the net was closing in and that the next opportunity to kill Hitler must be taken because there might not be another. In the morning of 20 July Stauffenberg flew back to the Wolfsschanze for another Hitler military conference, once again with a bomb in his briefcase. At around 12:30 pm as the conference began, Stauffenberg made an excuse to use a washroom in Wilhelm Keitel's office where he used pliers to crush the end of a pencil detonator inserted into a 1 kilogram (2.2 lb) block of plastic explosive wrapped in brown paper, that was prepared by Wessel von Freytag-Loringhoven. The detonator consisted of a thin copper tube containing cupric chloride that would take about ten minutes to silently eat through wire holding back the firing pin from the percussion cap. It was slow going due to war wounds that had cost Stauffenberg an eye, his right hand, and two fingers on his left hand. Interrupted by a guard knocking on the door advising him that the meeting was about to begin, he was not able to prime the second bomb, which he gave to his aide-de-camp, Werner von Haeften. Stauffenberg placed the single primed bomb inside his briefcase and, with the unwitting assistance of Major Ernst John von Freyend, entered the conference room containing Hitler and 20 officers, positioning the briefcase under the table near Hitler. After a few minutes, Stauffenberg received a planned telephone call and left the room. It is presumed that Colonel Heinz Brandt, who was standing next to Hitler, used his foot to move the briefcase aside by pushing it behind the leg of the conference table, thus unwittingly deflecting the blast from Hitler but causing his own demise and the loss of one of his legs when the bomb detonated. At 12:42 the bomb detonated, demolishing the conference room and killing a stenographer. More than 20 people were injured with three officers later perishing. Hitler survived, as did everyone else who was shielded from the blast by the conference table leg. 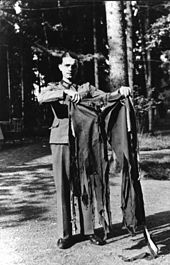 His trousers were singed and tattered (see photograph below) and he suffered from a perforated eardrum, as did most of the other 24 people in the room. Stauffenberg was seen leaving the conference building by Kurt Salterberg, a soldier on guard duty who did not consider this out of the ordinary as attendees sometimes left to collect documents. He then saw a "massive" cloud of smoke, wood splinters and paper and men being hurled through a window and door. Stauffenberg, upon witnessing the explosion and smoke, erroneously assumed that Hitler was truly dead. He then climbed into a staff car with his aide Werner von Haeften and managed to bluff his way past three checkpoints to exit the Wolfsschanze complex. Werner von Haeften then tossed the second unprimed bomb into the forest as they made a dash for Rastenburg airfield, reaching it before it could be realised that Stauffenberg could be responsible for the explosion. By 13:00 he was airborne in a Heinkel He 111 arranged by General Eduard Wagner. By the time Stauffenberg's aircraft reached Berlin about 16:00, General Erich Fellgiebel, an officer at the Wolfsschanze who was in on the plot, had phoned the Bendlerblock and told the plotters that Hitler had survived the explosion. As a result, the plot to mobilise Operation Valkyrie would have no chance of succeeding once the officers of the Reserve Army knew that Hitler was alive. There was more confusion when Stauffenberg's aircraft landed and he phoned from the airport to say that Hitler was in fact dead. The Bendlerblock plotters did not know whom to believe. Finally at 16:00 Olbricht issued the orders for Operation Valkyrie to be mobilised. The vacillating General Fromm, however, phoned Field Marshal Wilhelm Keitel at the Wolf's Lair and was assured that Hitler was alive. Keitel demanded to know Stauffenberg's whereabouts. This told Fromm that the plot had been traced to his headquarters, and that he was in mortal danger. Fromm replied that he thought Stauffenberg was with Hitler. 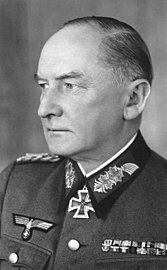 Meanwhile, Carl-Heinrich von Stülpnagel, military governor of occupied France, managed to disarm the SD and SS, and captured most of their leadership. He travelled to Günther von Kluge's headquarters and asked him to contact the Allies, only to be informed that Hitler was alive. At 16:40 Stauffenberg and Haeften arrived at the Bendlerblock. Fromm, presumably to protect himself, changed sides and attempted to have Stauffenberg arrested. Olbricht and Stauffenberg restrained him at gunpoint and Olbricht then appointed General Erich Hoepner to take over his duties. By this time Himmler had taken charge of the situation and had issued orders countermanding Olbricht's mobilisation of Operation Valkyrie. In many places the coup was going ahead, led by officers who believed that Hitler was dead. 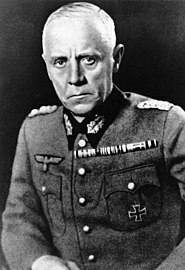 City Commandant, and conspirator, General Paul von Hase ordered the Wachbataillon Großdeutschland, under the command of Major Otto Ernst Remer, to secure the Wilhelmstraße and arrest Propaganda Minister Joseph Goebbels. In Vienna, Prague, and many other places troops occupied Nazi Party offices and arrested Gauleiters and SS officers. At around 18:10, the commander of Military District III (Berlin), General Joachim von Kortzfleisch, was summoned to the Bendlerblock; he angrily refused Olbricht's orders, kept shouting "the Führer is alive", was arrested and was held under guard. General Karl Freiherr von Thüngen was appointed in his place, but proved to be of little help. General Fritz Lindemann, who was supposed to make a proclamation to the German people over the radio, failed to appear and as he held the only copy, Beck had to work on a new one. At 19:00, Hitler was sufficiently recovered to make phone calls. He called Goebbels at the Propaganda Ministry. Goebbels arranged for Hitler to speak to Major Remer, commander of the troops surrounding the Ministry. After assuring him that he was still alive, Hitler ordered Remer to regain control of the situation in Berlin. Major Remer ordered his troops to surround and seal off the Bendlerblock, but not to enter the buildings. At 20:00 a furious Witzleben arrived at the Bendlerblock and had a bitter argument with Stauffenberg, who was still insisting that the coup could go ahead. Witzleben left shortly afterwards. At around this time the planned seizure of power in Paris was aborted when Field Marshal Günther von Kluge, who had recently been appointed commander-in-chief in the west, learned that Hitler was alive. As Remer regained control of the city and word spread that Hitler was still alive, the less resolute members of the conspiracy in Berlin began to change sides. 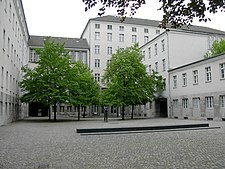 Fighting broke out in the Bendlerblock between officers supporting and opposing the coup, and Stauffenberg was wounded. By 23:00 Fromm had regained control, hoping by a show of zealous loyalty to save himself. Beck, realising the situation was hopeless, shot himself—the first of many attempted suicides in the coming days. At first Beck only seriously wounded himself—he was then shot in the neck and killed by soldiers. Fromm convened an impromptu court martial consisting of himself, and sentenced Olbricht, Stauffenberg, Haeften and another officer, Albrecht Mertz von Quirnheim, to death. At 00:10 on 21 July they were executed in the courtyard outside, possibly to prevent them from revealing Fromm's involvement. Others would have been executed as well, but at 00:30 SS personnel led by Otto Skorzeny arrived and further executions were forbidden. The original order given from Hitler to Remer was to capture the members of the conspiracy alive. Over the following weeks, Himmler's Gestapo, driven by a furious Hitler, rounded up nearly everyone who had the remotest connection with the plot. 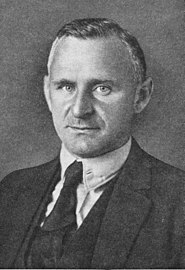 The discovery of letters and diaries in the homes and offices of those arrested revealed the plots of 1938, 1939, and 1943, and this led to further rounds of arrests, including that of Franz Halder, who finished the war in a concentration camp. Under Himmler's new Sippenhaft (blood guilt) laws, many relatives of the principal plotters were also arrested in the immediate aftermath of the failed plot. When I heard that German officers had tried to kill Adolf Hitler ... I was enraged. I fully concurred with the sentences imposed on them, strangling I felt was too good for them; this was the time, precisely, when we were at a very ... precarious military situation. And the only man who could possibly stave off disaster ... was Adolf Hitler. That opinion was shared by many Germans, Germans who did not adore Hitler, who did not belong to the [Nazi] Party. The British radio also named possible suspects who had not yet been implicated but then were arrested. Very few of the plotters tried to escape or to deny their guilt when arrested. Those who survived interrogation were given perfunctory trials before the People's Court, a kangaroo court that always decided in favour of the prosecution. The court's president, Roland Freisler, was a fanatical Nazi seen shouting furiously and insulting the accused in the trial, which was filmed for propaganda purposes. The plotters were stripped of their uniforms and given old, shabby clothing to humiliate them for the cameras. The officers involved in the plot were "tried" before the Court of Military Honour, a drumhead court-martial that merely considered the evidence furnished to it by the Gestapo before expelling the accused from the Army in disgrace and handing them over to the People's Court. The first trials were held on 7 and 8 August 1944. Hitler had ordered that those found guilty should be "hanged like cattle". Many people took their own lives prior to either their trial or their execution, including Kluge, who was accused of having knowledge of the plot beforehand and not revealing it to Hitler. Stülpnagel tried to commit suicide, but survived and was hanged. The whole world will vilify us now, but I am still totally convinced that we did the right thing. Hitler is the archenemy not only of Germany but of the world. When, in few hours' time, I go before God to account for what I have done and left undone, I know I will be able to justify what I did in the struggle against Hitler. None of us can bewail his own death; those who consented to join our circle put on the robe of Nessus. A human being's moral integrity begins when he is prepared to sacrifice his life for his convictions. Fromm's attempt to win favour by executing Stauffenberg and others on the night of 20 July had merely exposed his own previous lack of action and apparent failure to report the plot. Having been arrested on 21 July, Fromm was later convicted and sentenced to death by the People's Court. Despite his knowledge of the conspiracy, his formal sentence charged him with poor performance in his duties. He was executed in Brandenburg an der Havel. Hitler personally commuted his death sentence from hanging to the "more honourable" firing squad. Erwin Planck, the son of the famous physicist Max Planck, was executed for his involvement. The Kaltenbrunner Report to Adolf Hitler dated 29 November 1944 on the background of the plot, states that the Pope was somehow a conspirator, specifically naming Eugenio Pacelli, Pope Pius XII, as being a party in the attempt. Evidence indicates that 20 July plotters Colonel Wessel von Freytag-Loringhoven, Colonel Erwin von Lahousen, and Admiral Wilhelm Canaris were involved in the foiling of Hitler's alleged plot to kidnap or murder Pope Pius XII in 1943, when Canaris reported the plot to Italian counterintelligence officer General Cesare Amè, who passed on the information. A member of the SA convicted of participating in the plot was Wolf-Heinrich Graf von Helldorf, who was the Orpo Police Chief of Berlin and had been in contact with members of the resistance since before the war. Collaborating closely with Arthur Nebe, he was supposed to direct all police forces in Berlin to stand down and not interfere in the military actions to seize the government. However, his actions on 20 July had little influence on the events. For his involvement in the conspiracy, he was later arrested, convicted of treason and executed. After 3 February 1945, when Freisler was killed in an American air raid, there were no more formal trials, but as late as April, with the war weeks away from its end, Canaris' diary was found, and many more people were implicated. Executions continued to the last days of the war. Hitler took his survival to be a "divine moment in history", and commissioned a special decoration to be made for each person wounded or killed in the blast. The result was the Wound Badge of 20 July 1944. The badges were struck in three values: gold, silver, and black (the colors denoted the severity of the wounds received by each recipient). A total of 100 badges were manufactured, and 47 are believed to have actually been awarded. Each badge was accompanied by an ornate award document personally signed by Hitler. The badges themselves bore a facsimile of his signature, making them among the rarest decorations to have been awarded by Nazi Germany. For his role in stopping the coup, Major Remer was promoted to colonel and ended the war as a major general. After the war, he co-founded the Socialist Reich Party and remained a prominent Neo-Nazi and advocate of Holocaust Denial until his death in 1997. Philipp von Boeselager, the German officer who provided the plastic explosives used in the bomb, escaped detection and survived the war. He was the second-to-last survivor of those involved in the plot and died on 1 May 2008, aged 90. The last survivor of the 20 July Plot was Ewald-Heinrich von Kleist-Schmenzin, the thwarted plotter of just a few months before. He died on 8 March 2013, aged 90. As a result of the failed coup, every member of the Wehrmacht was required to reswear his loyalty oath, by name, to Hitler and, on 24 July 1944, the military salute was replaced throughout the armed forces with the Hitler Salute in which the arm was outstretched and the salutation Heil Hitler was given. The conspirators were earlier designated positions in secret to form a government that would take office after the assassination of Hitler were it to prove successful. Because of the plot's failure, such a government never rose to power and most of its members were executed. Albert Speer was listed in several notes of the conspirators as a possible Minister of Armaments; however, most of these notes stated Speer should not be approached until after Hitler was dead and one conjectural government chart had a question mark beside Speer's name. This most likely saved Speer from arrest by the SS in addition to Speer being one of Hitler's closest and most trusted friends. Wilhelm, Crown Prince of Germany was also under suspicion as he was touted to be head of state after Hitler. The extent of Field Marshal Erwin Rommel's involvement in the military's resistance against Hitler or the 20 July plot is difficult to ascertain, as people most directly involved did not survive and limited documentation on the conspirators' plans and preparations exists. Thus, Rommel's participation remains ambiguous and the perception of it largely has its source in the subsequent events (especially Rommel's forced suicide) and the accounts by surviving participants. According to a post-war account by Karl Strölin, the Oberbürgermeister of Stuttgart at that time, he and two other conspirators, Alexander von Falkenhausen and Carl Heinrich von Stülpnagel began efforts to bring Rommel into the anti-Hitler conspiracy in early 1944. On 15 April 1944 Rommel's new chief of staff, Hans Speidel, arrived in Normandy and reintroduced Rommel to Stülpnagel. Speidel had previously been connected to Carl Goerdeler, the civilian leader of the resistance, but not to the plotters led by Stauffenberg, and only came to the attention of Stauffenberg due to his appointment to Rommel's headquarters. The conspirators felt they needed the support of a field marshal on active duty. Witzleben was a field marshal, but had not been on active duty since 1942. The conspirators gave instructions to Speidel to bring Rommel into their circle. Speidel met with former foreign minister Konstantin von Neurath and Strölin on 27 May in Germany, ostensibly at Rommel's request, although the latter was not present. Neurath and Strölin suggested opening immediate surrender negotiations in the West, and, according to Speidel, Rommel agreed to further discussions and preparations. Around the same timeframe, however, the plotters in Berlin were not aware that Rommel had reportedly decided to take part in the conspiracy. On 16 May, they informed Allen Dulles, through whom they hoped to negotiate with the Western Allies, that Rommel could not be counted on for support. Three days before the assassination attempt, on 17 July, Rommel's staff car was strafed by an Allied aircraft in France; he was hospitalised with major injuries and incapacitated on 20 July. Rommel opposed assassinating Hitler. After the war, his widow maintained that he believed an assassination attempt would spark a civil war. According to journalist and author William L. Shirer, Rommel knew about the conspiracy and advocated that Hitler be arrested and placed on trial. The historian Ian Becket argues that "there is no credible evidence that Rommel had more than limited and superficial knowledge of the plot" and concludes that he would not have acted to aid the plotters in the aftermath of the attempt on 20 July, while the historian Ralf Georg Reuth contends that "there was no indication of any active participation of Rommel in the conspiracy." Historian Richard J. Evans concluded that he knew of a plot, but was not involved. What is not debated are the results of the failed bomb plot of 20 July. Many conspirators were arrested and the dragnet expanded to thousands. Consequently, it did not take long for Rommel to come under suspicion. He was primarily implicated through his connection to Kluge. Rommel's name also came up in confessions made under torture by Stülpnagel and Hofacker, and was included in Goerdeler's papers on a list of potential supporters. Hofacker confessed that Rommel had agreed to demand for Hitler to step down, and if he refused, Rommel would join the other conspirators in deposing Hitler. Rommel was also planned to become a member of the post-Hitler government in papers drawn up by Goerdeler. Hitler knew it would cause a major scandal on the home front to have the popular Rommel publicly branded as a traitor. With this in mind, he opted to give Rommel the option of suicide via cyanide or a public trial by Freisler's People's Court. Rommel was well aware that being hauled before the People's Court was tantamount to a death sentence. He also knew that if he chose to stand trial, his family would have been severely punished even before the all-but-certain conviction and execution. With this in mind, he committed suicide on 14 October 1944. He was buried with full military honours and his family was spared from persecution; his cause of death did not come to light until after the war. General Erich Hoepner at the Volksgerichtshof. In 1941, Hoepner called for an extermination war against the Slavs in the Soviet Union. Involvement of the plotters in war crimes and atrocities has been studied by historians such as Christian Gerlach. Gerlach proved that plotters like Tresckow or Gersdorff were aware of mass murder happening in the East from at least 1941. He writes: "Especially with reference to the murder of the Jews, [it is said that] 'the SS' had deceived the officers by killing in secret, filing incomplete reports or none at all; if general staff offices protested, the SS threatened them." Gerlach concludes: "This is, of course, nonsense." Tresckow also "signed orders for the deportation of thousands of orphaned children for forced labor in the Reich"—the so-called Heu-Aktion. Such actions lead historians to question the motives of the plotters, which seemed more concerned with the military situation than with Nazi atrocities and German war crimes. However some others assert that, in such actions, Tresckow had to act out of principle to continue with his coup plans. Gerlach pointed out that the plotters had "selective moral criteria" and while they were concerned about Jews being exterminated in the Holocaust, they were far less disturbed about mass murder of civilians in the East. To Gerlach, the primary motivation of the plotters was to ensure German victory in the war or at least prevent defeat. Gerlach's arguments were later supported by historian Hans Mommsen, who stated that the plotters were interested above all in military victory. But Gerlach's arguments were also criticized by some scholars, among them Peter Hoffmann from McGill University and Klaus Jochen Arnold [de] from the Konrad-Adenauer-Stiftung. While acknowledging that Tresckow and other 20 July conspirators had been involved in war crimes, Arnold writes that Gerlach's argument is oversimplified. A 1951 survey by the Allensbach Institute revealed that "Only a third of respondents had a positive opinion about the men and women who had tried unsuccessfully to overthrow the Nazi regime." The "first official memorial service for the resistance fighters of July 20" was held on the tenth anniversary in 1954. In his speech at the event, Theodor Heuss, the first President of the Federal Republic of Germany, said that "harsh words" were necessary, and that "There have been cases of refusal to carry out orders that have achieved historic greatness." After this speech, public opinion in Germany began to shift. East Germany's communist leadership had ignored the assassination attempt for decades, mainly because the conservative and aristocratic conspirators around Stauffenberg did not match the socialist ideal. The first all-German commemoration of the event did not take place until 1990. In 2013, the last surviving member of the plot, Ewald-Heinrich von Kleist-Schmenzin, died in Munich. As of 2014, the resistance fighters are generally considered heroes in Germany, according to Deutsche Welle. ^ Winston Churchill,war annual books, "1944"
^ William L. Shirer The Rise and Fall of the Third Reich, part IV, chapter "20th July"
^ Hoffmann 1996, pp. 608–609. ^ According to Shirer, Führer Conferences on Naval Affairs, 1960, p. 1393. ^ Kurtz 1946, p. 224. ^ a b c Kurtz 1946, p. 226. ^ Fest 1997, p. 188. ^ von Schlabrendorff, Fabian, They Almost Killed Hitler, p. 39. ^ Evans 2015, p. 198. ^ a b Fest 1997, p. 236. ^ Evans 2015, pp. 198–199. ^ War of extermination page 137. ^ Kaminski, Joseph. "The Plots to Kill Hitler". Archived from the original on 7 April 2015. ^ Fest 1997, p. 219. ^ Hoffmann, Peter. "Oberst i. G. Henning von Tresckow und die Staatsstreichpläne im Jahr 1943"[permanent dead link]. ^ Fest 1997, p. 220. ^ Moorhouse 2007, p. 241. ^ Fest 1997, p. 228. ^ Himmler's contacts with the opposition and his possible motives are discussed by Padfield, Himmler, pp. 419–424. ^ "6 assassination attempts on Hitler". Geopol Intelligence. 28 August 2015. Retrieved 23 June 2018. ^ Hoffman, Peter (1996). The History of the German Resistance, 1933–1945. McGill-Queen's Press. ISBN 0773515313. ^ Thomsett, Michael C. (1997). The German Opposition to Hitler: The Resistance, the Underground, and Assassination Plots, 1938–1945. McFarland. ISBN 0786403721. ^ Gitta Sereny (9 August 1996). Albert Speer His Battle With The Truth. Picador. ISBN 0330346970. ^ Martin A. Allen (2005). Himmler's Secret War: The Covert Peace Negotiations of Heinrich Himmler. Robson Books. ISBN 1861058896. ^ Galante & Silianoff 1991, photo insert section. ^ a b c Kurtz 1946, p. 227. ^ Galante & Silianoff 1991, pp. 11–12. ^ a b Galante & Silianoff 1991, p. 209. ^ Hoffmann 1996, p. 426. ^ Fest 1997, pp. 270–272. ^ Loeffel, Robert (2012-05-29). Family Punishment in Nazi Germany: Sippenhaft, Terror and Myth. Palgrave Macmillan. ISBN 9780230343054. ^ The Gestapo claimed 7,000 arrests. This can be found in William L. Shirer's Rise and Fall of the Third Reich, ch. 29. ^ Kershaw, Ian. Hitler 1936–1945: Nemesis, p. 693. ^ Metternich, Tatiana (1976). Purgatory of Fools. Quadrangle. p. 202. ISBN 0812906918. ^ a b See Shirer 1070–1071. ^ Fest 1997, pp. 289–290. ^ "Alleged July Plot Conspirators Executed in Plötzensee Prison". Archived from the original on 14 May 2009. Retrieved 19 April 2009. ^ Heideking, Jürgen; Mauch, Christof (1998). American Intelligence and the German Resistance to Hitler: A Documentary History. Widerstand: Dissent and Resistance in the Third Reich Series (revised ed.). Boulder, CO: Westview Press. ISBN 9780813336367. ^ Pave the Way Foundation Reveals Evidence of Pope Pius XII's Active Opposition to Hitler, 29 June 2009. Accessed 4 September 2009. Archived 6 September 2009. ^ Ted Harrison: "Alter Kämpfer" im Widerstand. Graf Helldorff, die NS-Bewegung und die Opposition gegen Hitler. Vierteljahrshefte für Zeitgeschichte 45(1997) (PDF, 6,5 MB), p. 385–423. ^ Holocaust Denial on Trial: Using History to Confront Distortions Archived 18 September 2009 at the Wayback Machine. "Biographies: Otto Remer," (retrieved on 10 April 2009). ^ "Hitler plot survivor dies aged 90". London: BBC News Online. 2 May 2008. ^ "Hitler assassination plotter Von Kleist dies". London: BBC News Online. 12 March 2013. ^ Hoffmann 1996, p. 367. ^ Speer, Albert. Inside the Third Reich. ^ a b c Beckett 2014, p. 6. ^ Shirer 2011, pp. 1031, 1177. ^ Hart 2014, pp. 142–150. ^ Hart 2014, pp. 139–142. ^ Hart 2014, p. 146. ^ Hart 2014, pp. 145–146. ^ Hart 2014, p. 140. ^ Reuth 2005, p. tbd. ^ a b Evans 2009, p. 642. ^ Hart 2014, p. 152. ^ Hart 2014, pp. 141, 152. ^ Reuth 2005, p. 183. ^ Jones, Nigel H. (1 January 2008). Countdown to Valkyrie: The July Plot to Assassinate Hitler. Philadelphia: Casemate. p. 261. ISBN 9781848325081. ^ Burleigh, Michael (2001). The Third Reich: A New History. Pan Macmillan. p. 521. ISBN 978-0-330-48757-3. ^ Peter Hoffmann, Carl Goerdeler and the Jewish question, 1933–1942, Cambridge ; New York : Cambridge University Press, 2011, xvi. ^ a b c d Dittrich, Monika (2014-07-20). "How traitors became heroes". Deutsche Welle. Retrieved 2014-07-20. ^ "Operation Valkyrie - The "July Plot" to Assassinate Hitler | Jewish Virtual Library". www.jewishvirtuallibrary.org. Retrieved 2016-11-18. Beckett, I.F.W. (2014). Rommel Reconsidered. Mechanicsburg: Stackpole. ISBN 9780811714624. Büchner, A. (1991). German Infantry Handbook, 1939–1945: Organization, Uniforms, Weapons, Equipment, and Operations. Atglen: Schiffer. ISBN 9780887402845. Evans, R.J. (2009) . The Third Reich at War: How the Nazis Led Germany from Conquest to Disaster. 3. London: Penguin. ISBN 9780141015484. Evans, R.J. (2015) . Rereading German History: From Unification to Reunification 1800–1996. Abingdon: Routledge. ISBN 9781317541882. Fest, J.C. (1997) . Plotting Hitler's Death: The Story of German Resistance. New York City: Henry Holt and Company. ISBN 9780805056488. Galante, P.; Silianoff, E. (1981). Operation Valkyrie: The German Generals' Plot Against Hitler. New York City: Harper & Row. ISBN 9780060380021. Hart, R.A. (2014). "Rommel and the 20th July Bomb Plot". Rommel Reconsidered. By Beckett, I.F.W. Mechanicsburg: Stackpole. ISBN 9780811714624. Hoffmann, P.C.W. (1996). History of the German Resistance, 1933–1945. Montreal: McGill-Queen's. ISBN 9780773515314. Kurtz, H. (1946) . "The July Plot". The Course of German History. By Taylor, A. J. P. Abingdon: Methuen. ISBN 9781134521968. Moorhouse, R. (2007) . Killing Hitler: The Plots, the Assassins, and the Dictator Who Cheated Death. New York City: Bantam. ISBN 9780553382556. Schrader, H. (2009). Codename Valkyrie: General Friedrich Olbricht and the Plot Against Hitler. Sparkford: Haynes. ISBN 9781844255337. Reitlinger, G.R. (1989) . The SS: Alibi Of A Nation, 1922–1945. New York City: Da Capo. ISBN 9780306803512. Reuth, R.G. (2005) . Rommel: The End of a Legend. London: Haus. ISBN 9781904950202. Shirer, W.L. (2011) . The Rise and Fall of the Third Reich. New York City: RosettaBooks. ISBN 9780795317002. Wheeler-Bennett, J. (2005) . The Nemesis of Power: The German Army in Politics 1918–1945. London: Palgrave Macmillan. ISBN 9781403918123.